News Blaze, an alternative business and world news newspaper, has published an article entitled “The Silk Road, Back to the Future, Port of Baku” by US journalist Nurit Greenger. 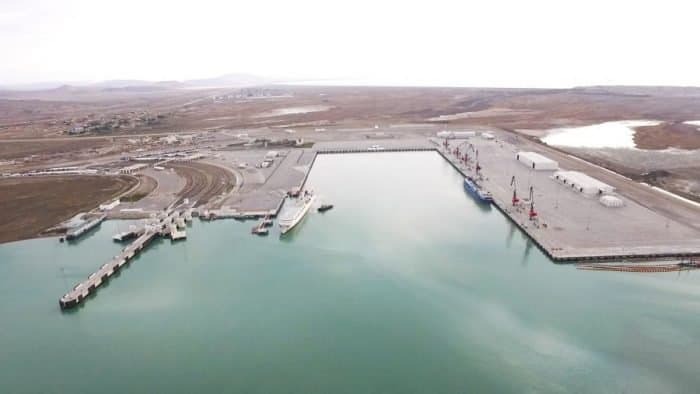 One of Azerbaijan’s major national projects is its new port. A country that is land-locked must find a way to undo the lock and access ports. Its first phase fully financed by the government, was completed. It is a start-up of an innovative and creative international hub of hubs port. Mr. Taleh Ziyadov, who was educated at Georgetown and Cambridge universities, is the Director General of the Port of Baku. Several times I heard him tell the story of how the port project idea was born. I recently had the opportunity sit with Mr. Ziyadov and receive a first hand lesson in the global trade routes’ history that goes back thousands of years and in which Azerbaijan played a central role. The Silk Road was an ancient network of trade routes that connected the East and West. For many centuries it was central to cultural interaction between the regions it connected. The Silk Road refers to both the terrestrial and the maritime routes connecting East Asia and Southeast Asia with East Africa, West Asia and Southern Europe. On that Silk Road Azerbaijan was an important hub. In 2007 the port’s project began by starting to build and then move the existing port to Alat, a small town near the capital city of Baku. It is located on the ancient Silk Road, linking China, Central Asia and Europe via Azerbaijan. 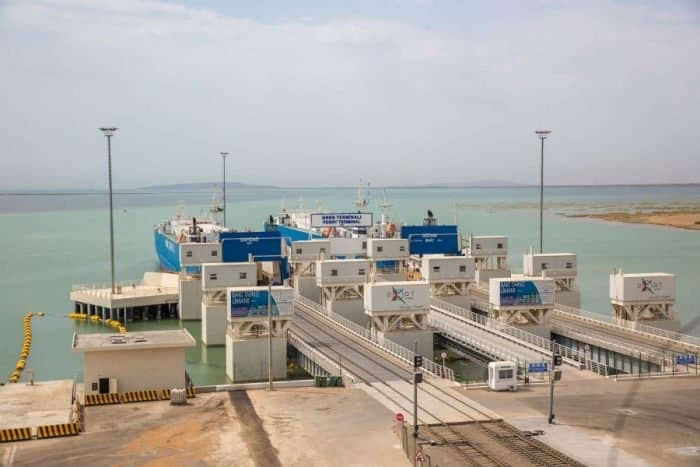 It has 1000 acres of land, with natural water breaker, the port’s completed first phase that was fully funded by the Republic of Azerbaijan’s government has the capacity of 15 million tons cargo and 100,000 containers a day. After the second phase, its goals is to be built with assisting funds from international investments, will be completed, the port capacity will increase to 21 million tons cargo and 500,000 containers a day. All services will be fully automated and interlinked. Due to the fact that many cultures intersected in Azerbaijan, historically and traditionally that country has been a bridging point between east and west. Azerbaijan acted as an intercultural and interfaith-interethnic tolerance center. The country is a united society mix that shaped Azerbaijan, and it is the country’s major strength. Azerbaijan is working toward becoming a Super Hub, a hub of hubs, of super railways that are tailored passengers and cargo; roads and waterway that will link, in the most efficient way, a web of connectivity for and of the entire region and beyond. With Port of Baku, Azerbaijan is acting as the middle corridor; one will be able to put on rail a container of goods in China to arrive in Turkey in 9-11 days and in Europe in 17-19 days while marine time currently takes 25-30 days. How the Silk Road, 114 Bce – 1450 Ce Meets Baku Port of 2018? Port of Baku is eying to become a hub of hubs. Then, in ancient times, trade and transfer of goods from East to West and vice versa was done by caravans of camels sometimes 2 miles long. Each 25 miles or so the caravan had to stop for ‘refuel’ in a saray, a building, what is a castle/palace/headquarters, along the way in various countries, today known as a motel; men stopped to eat and rest and so did the animals. It was a one stop 3-star motel type. Marco Polo, an Italian merchant, explorer, and writer, born in the Republic of Venice whose travels on the Silk Road from his homeland Venice to the Far East, are recorded in Livres des merveilles du monde – The Travels of Marco Polo, a book that described to the Europeans the wealth and great size of China, its capital Peking, and other Asian cities and countries. In his book Polo depicts his journeys throughout Asia, giving Europeans their first comprehensive look into the inner workings of the Far East, including China, India, and Japan. In the 13th century, Marco Polo visited the then-Persian city of Baku. In his travel journal he mentioned numerous mysterious flames that could be found all over the region at various places of the Abşeron Peninsula. The phenomenon of natural flames in Azerbaijan can be attributed to its enormous natural gas reserves. However, when exploitation of these reserves began, most of the natural fires burned out, due to a reduction in underground pressure. In time the saray stops developed into classified stops’ levels: from 1-star-to-5-star motels-hotels, an arteries of functional bodies that organized trade for centuries; 3000 years of trade history that helped civilization progress and brought about innovation. The stop and stay in the 5-star saray was longer than one day, causing the local economy to grow, trade between the caravans to take place and thus created added value to the economy. It was no longer a transit spot, rather, a local larger community and greater economy were created, and thus added value to the economy emerged. The vision of the Port of Baku, standing in the middle of all hubs, is to be the region’s future 5-star added value saray, while neighboring countries are developing their ports to match the pattern of growth in order to feed each other’s economy and growth. Total value added, equivalent to revenue less outside purchases of materials and services. In business, added value means, the difference between the sale price and the production cost of a product which is the unit’s profit; in economics, the sum of the unit profit, the unit depreciation cost, and the unit labor cost is the unit value added. It is the summing value added per unit over all units sold is total value added. What will factually transpire in the Port of Baku: a container arrives at the port; it is opened, goods go through added value process, performed by local industry, and then are moved to next destination. For that purpose, on May 18, 2018, the Republic of Azerbaijan’s government passed the Alat Free Economic Zone Law, the most progressive type law in the world, focusing on import/export zero tax, zero customs’ fee added value. Goods could be ordered online and dispatched from Port of Baku. Azerbaijan is located in the middle of crowded 480 million population and is in a 2-3 hours flight distance to 45 countries. Apart from being close to east and west markets and supply, Azerbaijan is also blessed being a petrochemicals hub. The country’s political patronage of the oil sector protects the industry from outside groups and has sealed the sector. Azerbaijan’s oil policy has not changed for the past 25 years. In 1994, while Azerbaijan was defending itself in a war of aggression unleashed against it by neighboring Armenia, and before the country’s constitution of 1995 was approved, the government signed contracts with major oil companies. While oil rich countries reversed and changed oil contracts, Azerbaijan stuck to its signed original contacts, which brought about best international effect, stability and guaranteed future investments. For a country to thrive there must be projects to invest. Oil and gas is an investment proposition. Developing products and sharing knowledge brought about the State Oil Company of the Azerbaijan Republic (SOCAR), involved in exploring oil and gas fields, producing, processing, and transporting oil, gas, and gas condensate. A guaranteed, long term investment and protecting is a major stability factor. Since 1994 not as much as one comma was changed or moved in the terms and conditions of the agreements signed with the major oil companies. That proved to be excellent negotiations factor for the country. Almost 80% of oil production belongs to the Republic of Azerbaijan. In 2017, an extended production sharing agreement, for 25 more years was signed. These agreements could be duplicated and applied to the none-oil sector whereby products are not just arriving and departing the port, rather, the port is acting as a 5-star saray, an added value port. Business looks for predictable, sustainable and viable environment, less bureaucracy and less taxation. The vision is to turn Alat into a comprehensive smart, safe, sustainable green city, with a state of the art port, airport, logistic real-estate and manufacturing. Trade in the Port of Baku will be conducted on the smart phone, applying the latest, 21st advanced and created technology with constitutional law at present being considered for amendment. Azerbaijan’s Port of Baku, hub of hubs’ concept is original. The goal is that other countries will use the same concept for their own economic growth and the benefit of their local economies, enhancing the economic growth of countries from China on one end to Europe on the other hand. During the interview, Mr. Ziyadov was proud to announce that mentally, Azerbaijan is no longer a post-Communism-Soviet Union country. But the transformation has been a challenge. Change is a way to positively affect society; to gradually adopt changes that allow the population to adopt too. The country is in a phase of coming up with original ideas and implementing them. Mr. Ziyadov aims to have his country’s people grow in human index. At this junction, the port management is waiting for the green light for the software that will integrate with all neighboring ports of trade to be finalized. It will allow the merchants to know, at all times, where their cargo is, on what ship it is traveling and when the container will arrive to Azerbaijan’s hub of hubs port and an influential trade corridor, thus efficiently plan accordingly. It is a blessing that the right, smart and well thought oil revenue contacts made it possible for Azerbaijan to turn into a constantly prosperously growing country. It could have all taken a different course. Being a land-lock country, regional infrastructure development is a key factor. With the region’s countries following in the path of Azerbaijan, participating, contributing and competing, added value and innovation will be the key environment for global investments to come. Azerbaijan is the largest country in the South Caucasus region, located at the crossroads of Western Asia and Eastern Europe. It is bounded by the Caspian Sea to the east, Russia to the north, Georgia in the northwest, Armenia to the west, and Iran to the south. The Republic of Azerbaijan is in the region’s driving force and in the driver’s seat. The country is to become the regional hub of hubs, a 5-star saray and a leading force for goodness in the world. Thanks to the smart people like Mr. Ziyadov, the world is being edified of what is in-store for Azerbaijan, its citizens, the entire region and the world.